Dozens of Jewish teens cool off in Israel over the summer, as conflict in Donetsk heats up - and Aliyah rises. Dozens of Jewish teenagers from Ukraine have been brought to summer camp in Israel as a relief from the raging conflict in Donetsk, through a special Jewish Agency for Israel project funded by the Jewish Federations of North America and UJA Federation of Greater Toronto. At the same time, there has been a significant increase in the number of immigrants to Israel from southeastern Ukraine, the Jewish Agency reports - and inquiries to the immigration process have continued to pour in. Chairman of the Executive of The Jewish Agency Natan Sharansky reflected on the situation. "I grew up in southeastern Ukraine at a time when our lives were devoid of Judaism and Zionism was a dirty word," Sharansky said. "Today we at The Jewish Agency are able to help children in that same region connect to Jewish life and strengthen their ties to Israel." "This is important not only from a Zionist perspective, but from a humanitarian perspective, as well," he continued. "Today we are fulfilling that sacred mission in Ukraine and we will continue to do whatever we can to ensure that Jews are safe and secure no matter where they are." 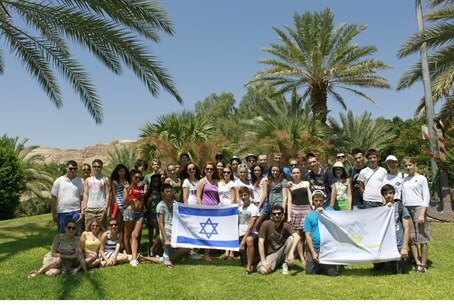 Some 40 teenagers between the ages of 14 and 17 from Donetsk and other embattled areas of Ukraine are currently participating in the ZMAN.IL summer camp, located on Kibbutz Kalia near the Dead Sea. During their time in Israel, they will tour the country, be immersed in Israeli culture, and learn about Jewish history. At the same time, Jewish Agency representatives are working intensively to provide individuals who wish to immigrate to Israel with immediate assistance. Since tensions flared in May, some 400 individuals have been rescued from the embattled areas and brought to Israel thanks to Christian organizations and the Jewish community of Dnepropetrovsk. The new immigrants were flown to Israel via Kharkov, Dnepropetrovsk, and Kiev. The most significant increases have been noted among immigrants from southeastern Ukraine. From the beginning of 2014 through the end of July, 509 individuals immigrated to Israel from Odessa (compared to 108 last year – a 371% increase), 666 from Kharkov (compared to 151 last year – a 341% increase), 338 from Dnepropetrovsk (compared to 93 – a 263% increase), 114 from Simferopol (compared to 41 – a 178% increase), and 305 from Kiev (compared to 201 – a 52% increase). Jewish immigration from Ukraine is being organized by The Jewish Agency in partnership with various Israeli government ministries - including the Ministry of Aliyah and Immigrant Absorption and the Ministry of Foreign Affairs - and organizations such as EZRA, along with the support of the Jewish Federations of North America and the International Fellowship of Christians and Jews.